Just about everyone in Washington these days is busying themselves talking about America's debt, plugging their ideas as the surefire solution to trim the deficit. In Tuesday's State of the Union address, President Obama offered belt-tightening proposals based on the recommendations of his bipartisan fiscal commission. Last week, House Republicans introduced a bill to sharply curb federal spending. But — despite those photos from countless Tea Party demonstrations, of children holding signs gloomily bemoaning their future debt — for most Americans, budget deficits aren't high on their list of concerns. "It always seems that when it comes time to cut, the most vulnerable — the poor, children and senior citizens — end up being the first to have their services reduced," said Gaskin. For him, Republicans lost all credibility for handling the deficit by insisting on tax breaks for the wealthiest Americans, which he says will only add to the nation's debt. "It never seems to be a shared sacrifice. The rhetoric is always to try to demonize people who are struggling." Cleaver is particularly against cuts to Medicare, even reductions that are unrelated to the actual administration of services. With House Republicans wielding the potential to vote against funding the health care reform law — which includes billions of dollars for community health centers in underserved communities — he's simply unwilling to tamper with the program designed to help senior citizens. Besides, in many states, such as his native Missouri, funding shortages have the program in trouble. "With all these uncertainties," he said, "why in the world would we want to start cutting Medicare?" 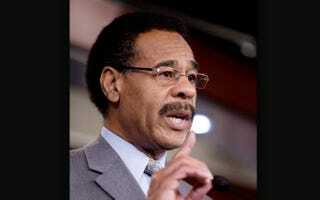 "If we're spending $10 billion to $14 billion a month on wars in Afghanistan and Iraq, it doesn't take much imagination to see what's dragging us down," said Cleaver, who has voted against funding both wars. As an example of what he considers to be wasteful defense spending, he cited Congress' continued votes to fund new C-17 transport planes — despite the fact that the Air Force has repeatedly stated that it doesn't want them. "We have enough bombs to destroy the world twice, but there are people who would like us to be able to do it 12 times," he quipped.